A skip is a great way to collect and dispose of waste. It has a large loading bay that can swallow a variety of rubbish and waste. But before you call up a skip hire company, it is better to know which skip size you need. Knowing about different skip sizes enables you to order a skip that fits your purpose just right. This can help save money as you avoid paying for a skip that is oversized for your requirements. 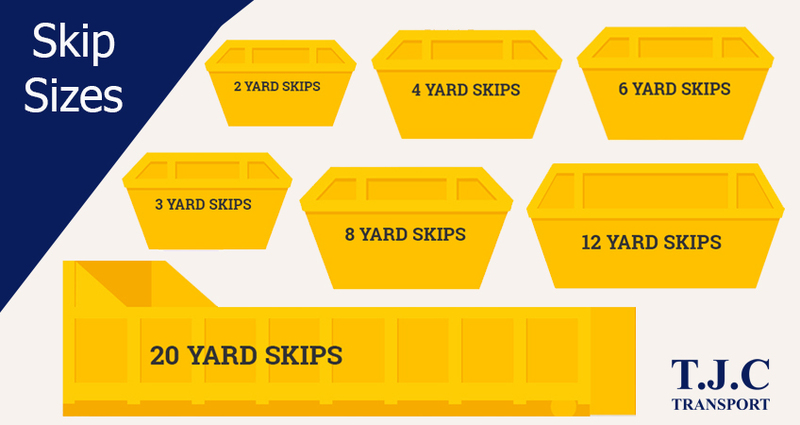 In keeping with that, here are different skip sizes explained through an easy-to-understand infographic. Skips smaller than 4-yard ones are typically used to haul waste generated by small tasks and projects. If you are looking for a cheap skip hire to collect and dispose of the waste leftover from a garden cleaning or house clearance, go for these skips. A small size also makes these skips portable, which can be useful if you are collecting the waste by moving the skip from room to room. A larger skip hire makes more sense if you have a renovation or construction project going on. However, it is common for people to choose a large skip hire size for major cleaning or clearing tasks as well. Depending upon the purpose, you can take your pick from 4-yard, 6-yard, 8-yard, 12-yard and 20-yard skip sizes. Of these, the 6- or 8-yard skips are usually referred to as the builder’s skip size because of their suitability to different types of building and construction works. This skip size guide is more of a primer on different skip sizes. If you’d like to know which skip size fits your needs the best, get in touch with us today. TJC Transport is the go-to name when it comes to skip hire in Essex. We can help you pick the right-sized skip by sending over an expert to your project site. Our expert understands your project, estimates the amount of rubbish and waste that will be generated and offers an appropriate skip size and quote accordingly. Call us today for a ‘FREE’ skip size quote.